Analysis: Despite being held out of the Bears' Week 17 win over the Vikings, Robinson shouldn't have any limitations during Saturday's wild-card game against Philadelphia. He'll face a shaky Eagles secondary that gave up the third-most receiving yards (3,082) to wide receivers during the regular season. Analysis: Robinson sat out Week 17's game against Minnesota due to an injury to his ribs that he sustained Week 16 against San Francisco. With No. 2 receiver Taylor Gabriel (ribs) and No. 3 receiver Anthony Miller (shoulder) also iffy to play this week, Robinson's potential return to the field is of significant importance for Chicago. The wideout's status will be updated no later than Wednesday when the first injury report of the week will be released. Coach Matt Nagy doesn't expect Robinson (ribs) to take part in Thursday's practice, Brad Biggs of the Chicago Tribune reports. Analysis: If Robinson is indeed absent, it would mark his second DNP in as many days as he tends to a rib injury. His activity level will be disclosed on the Bears' second Week 17 practice report. Robinson (ribs) was held out of practice Wednesday. Analysis: Coach Matt Nagy opened Wednesday by stating Robinson may not be a "full go" in practice due to a rib injury, per Patrick Finley of the Chicago Sun-Times. In fact, Robinson didn't participate in any capacity to kick off Week 17 preparations. 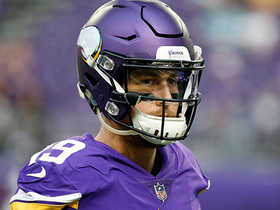 There doesn't seem to be any worry about his availability for the regular-season finale against the Vikings at this time, but it may start to creep in as long as he remains away from the practice field. Coach Matt Nagy said Robinson may be impacted by a rib injury during Wednesday's practice, Patrick Finley of the Chicago Sun-Times reports. 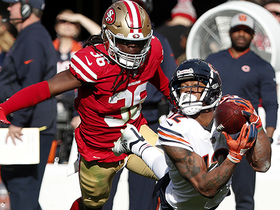 Robinson caught six passes for 85 yards along with one rushing attempt for an additional nine yards in the Bears' 14-9 victory over the 49ers. Robinson caught three of seven targets for 54 yards during Sunday's 24-17 win over the Packers. Robinson (hip) is active for Sunday's game against the Packers, Brad Biggs of the Chicago Tribune reports. Analysis: Though Robinson was listed as questionable heading into the weekend, his status never looked to be in much peril after he practiced fully Friday. Now that it's been confirmed he'll suit up, Robinson shouldn't face any restrictions with his snap count as the Bears look to avenge their Week 1 loss to their divisional rival. In that contest, Robinson reeled in four of seven targets for 61 yards. Robinson (hip) was a full practice participant Friday, but he's listed as questionable for Sunday's game against the Packers, Dan Wiederer of the Chicago Tribune reports. Robinson (hip) was a limited participant in Thursday's practice, Rich Campbell of the Chicago Tribune reports. Analysis: The lone player on the Bears' Week 15 injury report, Robinson doesn't seem in any peril of sitting out Sunday in Green Bay. Coach Matt Nagy labeled Robinson's absence from Wednesday's practice as a maintenance day, and the wideout's involvement in Thursday's session has him trending in the right direction as the weekend approaches. During his Bears debut in the season opener against this same Packers squad, Robinson was targeted seven times, reeling in four of them for 61 yards. Coach Matt Nagy said Robinson (hip) is expected to practice Thursday, Colleen Kane of the Chicago Tribune reports. Analysis: Robinson was held out of Wednesday's session due to a hip injury, but Nagy merely termed it a "maintenance day." The preceding seems to signal Robinson's availability for Week 15 isn't in peril. However, Thursday's practice report will reveal how many reps he was able to handle. Robinson was listed as a non-participant at Wednesday's practice with a hip injury, Rich Campbell of the Chicago Tribune reports. Analysis: After attempting to play through a groin injury earlier this season, Robinson was withheld from action in Weeks 8 and 9, so there is precedent for absences in his new locale. On the other hand, there's been no indication he's in danger of missing time due to his latest health issue. Consequently, Robinson's status bears monitoring as the weekend approaches to get a sense of his availability for Sunday's game against the Packers. Robinson caught five passes (eight targets) for 42 yards in Sunday's 15-6 victory over the Rams. 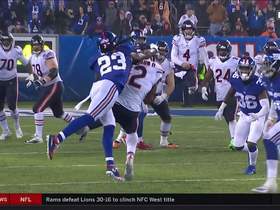 Robinson brought in five of nine targets for 79 yards in the Bears' 30-27 overtime loss to the Giants on Sunday. Robinson brought in two of four targets for 39 yards in the Bears' 23-16 win over the Lions on Thursday. Robinson caught three passes for 39 yards in Chicago's 25-20 win over the Vikings on Sunday. Analysis: Robinson saw quite a bit of the Vikings' top cornerback, Xavier Rhodes, which made it difficult to provide Mitch Trubisky with the type of separation that would have led to a more productive evening. In addition, the Bears played with a lead for almost the entire contest, so there was no urgency to send more than seven targets Robinson's way. With just one explosive outing on the season, he'll continue to be a volume-based starting fantasy option going forward. Robinson (groin) brought in six of eight targets for 133 yards and two touchdowns in the Bears' 34-22 win over the Lions on Sunday. Analysis: Robinson made a splash in his return from a two-game absence, generating a season high in receiving yards while also scoring multiple touchdowns for the first time in a Bears uniform. The 25-year-old looked to be at full health while hauling in 36- and 26-yard scoring throws from Mitchell Trubisky, an encouraging sign for both the Bears and fantasy owners. Robinson will look to put together a successful encore against the Vikings in a big Week 11 divisional clash. Robinson (groin) doesn't have a designation on the final injury report for Sunday's game against the Lions. Analysis: A cautious approach the past two weeks paid off when Robinson deemed himself 100 percent healthy after logging full practices Wednesday and Thursday. He's been cleared from the injury report on the heels of another full practice Friday, preparing to take aim at a struggling Detroit defense that may be without top cornerback Darius Slay (knee). Robinson (groin) termed himself "100 percent" Thursday, Adam Jahns of the Chicago Sun-Times reports. Analysis: Robinson backed up his comment with another full practice session Thursday, per Kevin Fishbain of The Athletic. By avoiding any setbacks with the groin injury that forced absences the past two contests, Robinson is in line to take on a Lions defense Sunday that has allowed just shy of 10.0 yards per target and 10 touchdowns to wide receivers in eight games this season. Robinson (groin) practiced in full Wednesday. Coach Matt Nagy said Wednesday that he's hopeful Robinson (groin) will practice this week, Rich Campbell of the Chicago Tribune reports. Analysis: Since his last game appearance Week 7, Robinson's practice reps have been contained to a single limited listing on back-to-back Friday injury reports. As such, Nagy's comment seems to indicate Robinson is healthy enough to participate in some capacity for each session this week. With that said, Robinson's activity level won't be known until the release of the Bears' initial report later Wednesday. Coach Matt Nagy said Monday he still considers Robinson (groin) day-to-day. Analysis: Robinson played through his groin issue in a Week 7 loss to New England, then sat out the past two weeks as the Bears cruised to easy wins over the Jets and Bills. A more aggressive approach could be in order ahead of Sunday's game against the Lions, but we won't have a better idea until the Wednesday practice report is released. Robinson (groin) is inactive for Sunday's game against the Bills. 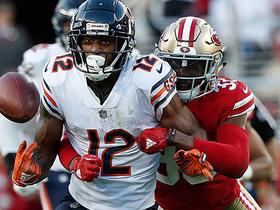 Analysis: Robinson was only able to manage only limited practice throughout the week while battling the groin injury, so the Bears will hold him out for a second straight contest to aid his recovery. With Robinson out of the mix, Josh Bellamy (four catches for 37 yards in the Week 8 win over the Jets) is expected to earn regular snaps alongside Taylor Gabriel and Anthony Miller in three-wideout sets. Robinson (groin) returned to practice Friday as a limited participant and is listed as questionable for Sunday's game at Buffalo, Colleen Kane of the Chicago Tribune reports. Robinson (groin) didn't practice Thursday, Rich Campbell of the Chicago Tribune reports. Analysis: Prior to an absence Week 8 against the Jets, Robinson opened with no participation at the first two practices. He's precisely replicated that regimen this week, which doesn't bode well for a return to action Sunday at Buffalo. Friday's injury report could elaborate on his potential to play this weekend. Conversely, if he's ruled out, Taylor Gabriel, Anthony Miller and even Kevin White would benefit among the team's wide receivers. Robinson (groin) was held out of practice Wednesday. Robinson (groin) is inactive for Sunday's game against the Jets. Robinson (groin), who is listed as questionable for Sunday's game against the Jets, isn't expected to play, Adam Schefter of ESPN reports. Robinson (groin) returned to practice Friday as a limited participant and is listed as questionable for Sunday's game against the Jets. Robinson (groin) was held out of Thursday's practice, Dan Wiederer of the Chicago Tribune reports. Robinson didn't practice Wednesday due to a groin injury, Rich Campbell of the Chicago Tribune reports. Analysis: The same injury prevented Robinson from putting in a full practice last week. While Robinson was ultimately active for Sunday's 38-31 loss to the Patriots and played 61 of the Bears' 82 offensive snaps, he caught just one of five targets for four yards. With an absence already to begin Week 8, Robinson's status will be monitored closely to get a read on his potential to play Sunday versus the Jets. 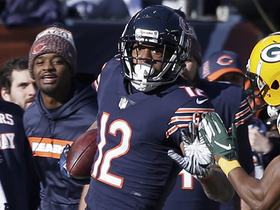 Robinson caught one pass for four yards in the Bears' Week 7 loss to the Patriots. Robinson (groin) is active for Sunday's game against the Patriots, Kevin Fishbain of The Athletic reports. Analysis: Robinson didn't practice fully any day this week while nursing the injury, but the Bears deemed him fit to play after he completed his pregame workout Sunday. Though he should stick in the starting lineup for Chicago, it's possible the wideout's snaps are managed more carefully than usual while he tends to the groin issue. If that's the case, more work could be in store for the likes of Taylor Gabriel, Anthony Miller and Trey Burton. Robinson (groin) is viewed as a game-time decision for Sunday's game against the Patriots, Ian Rapoport of NFL Network reports. Analysis: Apparently there's optimism he'll play, but the team wants to see how Robinson warms up prior to the game before signing off on his availability. Taylor Gabriel, Anthony Miller and Trey Burton could see more targets should Robinson not be able to go. Updating a previous report, Robinson (groin) returned to practice Friday as a limited participant and is listed as questionable for Sunday's game against the Patriots. Analysis: The limited practice is a good sign after Robinson was held out entirely Thursday. 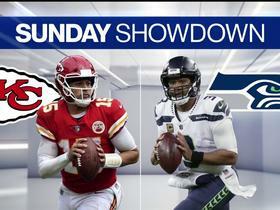 He might still come down to a game-time decision ahead of Sunday's 1 p.m. EDT kickoff, but the prognosis is much better than it would have been if he hadn't practiced in any capacity during the week. Should Robinson ultimately be ruled out, Anthony Miller and Kevin White would be the top candidates to handle the vacated snaps, with Taylor Gabriel, Trey Burton and Tarik Cohen all in the mix for added targets. Robinson (groin) missed practice again Friday and is listed as questionable for Sunday's game against the Patriots. Analysis: Robinson's failure to practice in any capacity this week suggests he's in serious danger of missing the game. 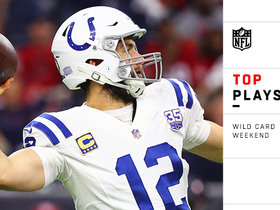 He may ultimately come down to a game-time decision ahead of the 1 p.m. EDT kickoff, with Anthony Miller and Kevin White shaping up as the top candidates to take on vacated snaps in the event of an absence. Taylor Gabriel, Trey Burton and Tarik Cohen might also see increased involvement in the passing game if Robinson's 7.6 targets per contest are removed from the equation. Robinson (groin) was a non-participant at Thursday's practice, Rich Campbell of the Chicago Tribune reports. Robinson was a limited practice participant Wednesday due to a groin injury, Colleen Kane of the Chicago Tribune reports. Analysis: Robinson scored touchdowns on either side of the Bears' Week 5 bye and has otherwise averaged 11.7 yards per reception and 7.4 yards per target in his new digs. As the Bears get ready for Sunday's matchup with the Patriots, he'll have two more sessions to ditch his injury designation. Robinson caught five of six targets for 64 yards and a touchdown in Sunday's 31-28 overtime loss to the Dolphins. Analysis: Robinson scored from 12 yards out in the third quarter and made a beautiful 21-yard catch on the sideline early in the fourth on a play that withstood a Miami challenge. He has at least 50 yards or a touchdown in every game heading into a Week 7 clash with the Patriots. Robinson brought in two of four targets for 23 yards and a touchdown in the Bears' 48-10 win over the Buccaneers on Sunday. Analysis: Robinson got into the end zone for the first time in a Chicago uniform when he brought in a 14-yard throw from Mitchell Trubisky in the first quarter. The 25-year-old did see only four targets with both Taylor Gabriel and Tarik Cohen taking on more prominent roles Sunday, but the end-zone visit certainly helped to round out his stat line nicely. Robinson will look to keep the momentum going against the Dolphins following a Week 5 bye. Robinson caught three passes for 50 yards in Sunday's 16-14 win over the Cardinals. Robinson caught 10 of 14 targets for 83 yards in Monday night's 24-17 win over the Seahawks. 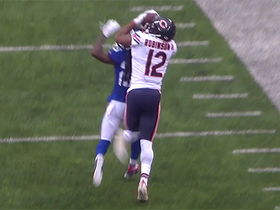 Analysis: Robinson comfortably led the Bears in all major receiving categories, making a strong impact in his home debut. In fact, Monday marked just the second time in Robinson's career that he finished with double-digit catches in a game. While that's certainly an encouraging sign to begin his time in Chicago, the team's top wideout will now look to find the end zone for the first time in his new colors Week 3 versus the Cardinals. Robinson caught four passes for 61 yards in Chicago's Week 1 loss to the Packers. Robinson will skip Saturday's preseason game against the Chiefs, Kevin Fishbain of The Athletic Chicago reports. Analysis: Robinson is among 31 Bears players who will sit out Saturday's preseason contest, seemingly joining the rest of the team's starters on the sidelines. It remains to be seen whether the coaching staff intends to reinsert starters for the preseason finale, but Robinson should be ready to roll as the team's top wideout for Week 1. Robinson was not targeted during Saturday's preseason game against the Broncos. Analysis: Even though Robinson didn't see any passes come his direction, it was still an encouraging night for anyone with investments in the receiver, as the Bears got creative with Robinson and delivered him several snaps in both the slot and on the boundary -- something that rarely happened during his time in Jacksonville. Robinson's next chance to log his first target as a member of the Bears will come in the team's third preseason game next Saturday against the Chiefs. 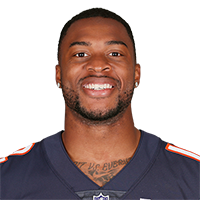 Bears head coach Matt Nagy confirmed Robinson will play in Saturday's preseason game at Denver, Adam Hoge of WGN Radio 720 AM Chicago reports. Robinson expects to play in Saturday's preseason game at Denver, Kevin Fishbain of The Athletic Chicago reports. Analysis: Robinson entered training camp with a clean bill of health but wasn't allowed to suit up for the Bears' first two exhibitions. After signing a three-year, $42 million contract in the offseason, he's expected to serve as Mitchell Trubisky's No. 1 option. With so many mouths to feed in Chicago, though, Robinson may struggle to approach the 151 targets he received in both 2015 and 2016. Robinson was held out of Monday's practice for scheduled rest, Rich Campbell of the Chicago Tribune reports. Coach Matt Nagy indicated Thursday that Robinson (ACL) will be fully healthy for the start of Chicago's training camp, Larry Mayer of the Bears' official site reports. Robinson (knee) is expected to be ready for practice when the Bears report to training camp July 19, ESPN.com's Jeff Dickerson reports. Robinson (ACL) was a limited participant in Wednesday's OTA session, Jeff Dickerson of ESPN.com reports. Bears head coach Matt Nagy said Tuesday that Robinson continues to focus on the "mental" aspect of his wideout role with the Bears as he sits out drills due to his ongoing recovery from a torn left ACL, Colleen Kane of the Chicago Tribune reports. Bears head coach Matt Nagy will install an offense with a fast pace while consistently attacking downfield, which should prove favorable for Robinson (knee), Adam Jahns of the Chicago Sun-Times reports. Analysis: Robinson proved to be a dynamic downfield threat in 2015, averaging 17.5 yards per reception and 14 touchdowns before struggling in 2016, largely due to the terrible inaccuracy shown by Blake Bortles that season. Though he'll be coming off a lost season following ACL surgery, Robinson should be in store for a huge bounce-back season in his first season in an offense that projects to be pass heavy and aggressive. Robinson (knee), who is signing a three-year, $42 million contract with the Bears, said he doesn't expect to start training camp on the Physically Unable to Perform list, Brad Biggs of the Chicago Tribune reports. Robinson (knee) intends to sign with the Bears when free agency opens Wednesday, ESPN's Adam Schefter reports. Analysis: Robinson's 2017 season was cut short almost as soon as it began when he tore his ACL In Week 1, but the setback did not prevent him from drawing heavy interest in free agency, and he appears headed to Chicago after four years in Jacksonville. Robinson's signing won't be official until Wednesday, but if he ends up with the Bears he would immediately become Mitchell Trubisky's top receiver. Robinson (knee) won't receive a franchise or transition tag from the Jaguars, Ian Rapoport of NFL Network reports. Jaguars head coach Doug Marrone said last week that Robinson (knee) is on track to take part in Organized Team Activities, Ryan O'Halloran of The Florida Times-Union reports. Robinson posted a video Wednesday on his personal Twitter account that showed him jogging at about half speed on the field. Robinson (knee), who is eligible to become a free agent this offseason, hopes to remain with the Jaguars, ESPN's Michael DiRocco reports. Robinson (knee) said Sunday that he would be able to pass a physical by the time free agency rolls around in March, Ryan O'Halloran of The Florida Times-Union reports. Analysis: Robinson, who tore his left ACL back on Sept. 10, continues to make progress in his recovery and profiles as one of the more intriguing potential free agents this offseason, in spite of his injury. Though the Jaguars have gotten solid production this season from No. 1 wideout Marqise Lee and rookies Dede Westbrook and Keelan Cole, it's suspected that the Jaguars would prefer to retain the 24-year-old Robinson, a notion echoed by Michael DiRocco of ESPN.com. Robinson (knee) has progressed to running on an AlterG treadmill, per his personal Twitter account. Bears wide receiver Allen Robinson talks about his return from knee injury, playing with QB Mitch Trubisky and the expectations for the team in 2018. Chicago Bears wide receiver Allen Robinson goes horizontal for a diving 43-yard catch. Chicago Bears quarterback Mitchell Trubisky tosses a short pass to wide receiver Allen Robinson who picks up 30 yards. Chicago Bears wide receiver Allen Robinson hauls in a contested grab on fourth down. Chicago Bears wide receiver Allen Robinson traps the ball on New York Giants cornerback B.W. Webb's helmet and catches for a 30-yard gain. 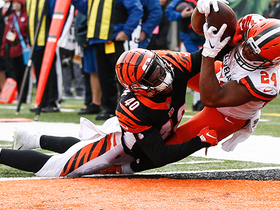 Take a look at the top catches around the NFL from Week 12.